Suppose you live in Community A and have a cardiac arrest. In Community A, when the call is received by the emergency dispatcher, immediate CPR instructions are given over the telephone. A fire department aid unit, staffed with emergency medical technicians (EMTs) and equipped with an automated external defibrillator (AED), arrives in four minutes and the first shock is delivered within five minutes of collapse. Six minutes later, paramedics arrive to stabilize the patient. In Community A, you stand a one in three chance of walking out of the hospital alive. Now let’s consider Community B. In Community B, there is no dispatcher-assisted telephone CPR program and first responders are not equipped with AEDs. Paramedics typically arrive within 10 minutes of collapse, but since bystanders did not provide CPR and first responders did not provide defibrillation, there is little chance of resuscitation. In Community B, your chance of surviving cardiac arrest is close to zero. The difference in survival between Community A and Community B clearly lies in the time from collapse to CPR and the time from collapse to delivery of the first defibrillatory shock. Automated external defibrillation offers the best means to provide a crucial life-saving shock quickly. The more AEDs present in the community, the greater the likelihood they will be used in time. I hope as you read through this information, you will keep foremost in your mind the concept that defibrillation—the spark of life—must be given quickly if it is to work. Ask yourself, “If my spouse suddenly collapsed in cardiac arrest, how many minutes would it take before a defibrillator arrived at the scene?” Clearly, the sooner an AED arrives, the greater the likelihood of survival. Do you live in Community B? If so, it’s time to take action. Sudden cardiac arrest (SCA) is one of the leading causes of death among adults in North America. Each year, it claims the lives of a quarter of a million people in the United States alone. Once every one or two minutes, another American succumbs suddenly, without warning. Most victims of sudden cardiac arrest are middle-aged or elderly. Though the average victim is about 65-years-old, some victims are in their 30s or 40s. Most collapse at home. For many, there is no previous history of heart problems. Sudden cardiac arrest is often the first symptom. Although victims of sudden cardiac arrest tend to fit in certain categories, sudden cardiac arrest, by its nature, is completely unpredictable. It can strike anyone, anywhere, any time. Chances are you know someone who has experienced sudden cardiac arrest—a friend, a relative or a co-worker. Sudden cardiac arrest does not have to result in “sudden death.” When sudden cardiac arrest occurs, most victims have an abnormal heart rhythm called ventricular fibrillation (VF). When the heart is in this state, it cannot beat in a coordinated fashion and blood does not circulate to the heart and the brain. First, the pulse stops. Then, breathing stops. The victim loses consciousness, collapses and appears lifeless. But the victim doesn’t have to stay that way. Ventricular fibrillation is a treatable rhythm. In this state, electrical energy is present in the heart, but it is chaotic. If the heart can be shocked quickly with a defibrillator, a normal heart rhythm may be restored. This is called defibrillation. If this shock is delivered within minutes after collapse, many victims can survive. Studies conducted at cardiac rehabilitation centers have shown that when sudden cardiac arrest victims in ventricular fibrillation receive defibrillation therapy within the first minute or two after collapse, more than 90 percent survive to be discharged from the hospital. In more typical community settings, victims of sudden cardiac arrest rarely survive. Why? Most victims do not have immediate access to prompt, definitive treatment. Too much time elapses before the defibrillator arrives—if it arrives at all. In New York City, for example, the average emergency response time is relatively long—about 12 minutes—due in part to traffic delays and the logistics of getting to victims in high-rise buildings. There, only 5 percent of witnessed VF victims—1 to 2 percent of all cardiac arrest victims—survive. 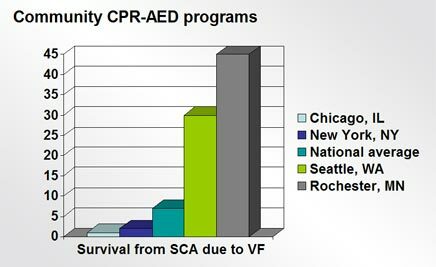 Seattle, on the other hand, has achieved an average response time of seven minutes and a VF survival rate of 30 percent. In Rochester, Minnesota, response times average six minutes and 43 percent of VF victims survive. In all reports of survival, the shorter the time from collapse to defibrillation, the better the chances of survival. If defibrillation is delayed for more than 10 minutes, survival rates drop to less than 5 percent. It is challenging in most community settings to respond consistently to sudden cardiac arrest victims within the one to two minute timeframe documented in some cardiac rehabilitation centers. But all communities can aim to reduce the critical interval from collapse to defibrillation, particularly with on-site AED programs. Since the exact time of collapse often is difficult to identify and measure, communities can focus on minimizing the interval from the 9-1-1 call to the first defibrillatory shock. Communities that reduce this “call-to-shock” time to five minutes or less can expect as many as one-third to one-half of sudden cardiac arrest victims found in ventricular fibrillation to be resuscitated. Reducing “call-to-shock” time by even one minute can mean the difference between life and death. Once victims are resuscitated, the prospects for long-term recovery are very promising. Eight in 10 survivors will live at least a year longer. Six in 10 survivors will live five more years. The American Heart Association and other organizations have adopted a simple action plan designed to help communities improve survival from sudden cardiac arrest in adults. This plan is called the Chain of Survival. Early follow-up care: The survivor received effective follow-up care. In other words, in the ideal situation, there is a strong community Chain of Survival. Early defibrillation has been called the critical link in the Chain of Survival because the time from collapse to defibrillation often is the key indicator of survival from sudden cardiac arrest. But the strength of the early defibrillation link depends on the strength of the the links that precede it. And the strength of these two links depends on EMS system planning and quick bystander action. Let’s take a closer look. If the ultimate goal in cases of sudden cardiac arrest is to deliver rapid defibrillation, it stands to reason that the sooner someone recognizes the emergency and decides to help, the sooner the rescue process can get underway. This is not as simple as it sounds. Bystanders at the scene of an unexpected cardiac emergency are faced with a sudden crisis. They may feel panicky, anxious and helpless. They may know intuitively that something is wrong, but the signals of an emergency often are ambiguous and hard to recognize. If they didn’t actually see the victim collapse, they may be even more uncertain. They may feel incompetent. They may think someone else more qualified will step forward. Sometimes, bystanders are so distraught, they deny that it’s happening. One common concern is the fear of being sued. It’s important for the public to know that there are no reported cases in which a bystander was successfully sued for trying in good faith to help a victim of cardiac arrest. In contrast, there have been occasional lawsuits directed against people who failed to help. It’s important for the public to recognize that the cardiac arrest victim is in a critical state. If no one helps, the victim will certainly die. Bystander actions can only help. When communities understand that it is natural to hesitate to help in emergencies, they can devise public awareness and education initiatives aimed to encourage bystander action. If you come upon an adult who has collapsed and is unresponsive, don’t waste time. Phone first! Call 9-1-1 or your local emergency number! Even if there is an AED on site, it is important to summon EMS responders immediately. What happens when you call 9-1-1 or the local emergency number varies widely from community to community. In the ideal community, the dispatcher who receives your call is an Emergency Medical Dispatcher (EMD) who is trained to explain to callers how to help people in distress. If the victim is in cardiac arrest, the EMD immediately dispatches appropriate emergency vehicles and personnel. Then the EMD talks the caller through the steps of CPR, regardless of whether the caller has had previous CPR training. As AEDs become more readily available for use by laypersons, it is likely that EMDs also will talk callers through the use of AEDs. Initiate media campaigns to increase public awareness about sudden cardiac arrest, the importance of helping without delay, and the importance of calling 9-1-1 or the local emergency number in the event of an apparent cardiac emergency. Encourage widespread CPR education to increase bystander knowledge about the importance of early EMS access. Find out whether local dispatchers are trained and certified in dispatch life support. If they are not, advocate for this vital training. Cardiopulmonary resuscitation, or CPR, is a simple emergency procedure used when someone stops breathing or the heart stops beating. CPR involves two basic actions: rescue breathing (mouth-to-mouth or mouth-to-mask resuscitation) and chest compressions. These actions help circulate oxygenated blood to the heart and brain. Early CPR increases the likelihood that early defibrillation will work. In fact, the likelihood of survival doubles if a bystander begins CPR before the EMS team arrives. Anyone who has a duty to respond to persons in cardiac arrest should be trained in CPR and should undergo refresher training on a regular basis. Regardless of duty, anyone who may be able to reach a victim of cardiac arrest before EMS arrives should know how to do CPR. Laypersons are most likely to arrive first at the scene of an arrest and chances are they will know the victim. In 75 to 80 percent of cases, sudden cardiac arrest occurs in the home. Another 10 to 15 percent of cases occur in the workplace. This is why almost everyone can and should learn CPR. Does the Quality of CPR Matter? Increasingly, researchers are finding that the quality of CPR has a major impact on the likelihood of survival. They have found it is important to provide strong, forceful compressions and to minimize interruptions in compressions. Ensure that the personnel who serve your community or workplace (e.g., firefighters, police officers, security officers, corporate safety personnel) have CPR training and review their skills on a regular basis. If CPR and AED training is not already offered in local schools, get it started. Ensure that all students learn CPR and AED use before they graduate from high school. In time, your community will have a broad base of citizens trained in CPR. Work with allies such as the American Heart Association, the American Red Cross, the American Safety and Health Institute, Medic First Aid International, the National Safety Council, local EMS agencies, hospitals and fire departments to promote widespread CPR-AED training. Numerous scientific studies conducted during the past 30 years have proven that rapid defibrillation is the single most important factor affecting survival from sudden cardiac arrest in adults. This research, coupled with important technological advances, has driven the international movement to increase access to early defibrillation. In the past, defibrillators were complicated and cumbersome. Only medical professionals with extensive training in heart rhythm interpretation could use them. Today, defibrillators are automated, portable and easy to use. These automated external defibrillators (AEDs) read heart rhythms and determine whether a shock should be delivered. In addition, AEDs have audio and visual prompts to guide trained operators. Who Should Carry An AED? Everyone who has a duty to respond to victims of sudden cardiac arrest should be trained and equipped to defibrillate. All personnel who typically arrive first at the scene of cardiac arrest and for whom responding to cardiac arrest is a primary job responsibility should have defibrillation capabilities. In most communities, this includes emergency medical technicians, firefighters and law enforcement personnel. The best strategies for achieving early defibrillation vary from community to community and should be determined at a local level. The key is to reduce time to defibrillation by ensuring that whoever typically gets there first is ready to defibrillate. How does an AED work? The AED is a device that is capable of identifying life-threatening rhythms that can be converted by electric shocks. Through the use of a computerized process, the AED can analyze and identify ventricular fibrillation (chaotic, unorganized movement of the heart) and ventricular tachycardia (abnormally fast contractions of the heart hindering blood flow), the two most common life-threatening heart rhythms that can be converted with electrical therapy. AEDs on the market today are portable and lightweight. They have visual and/or verbal prompts that guide the user through the rescue effort. When the responder turns on the AED, it immediately prompts the user to attach the AED to the victim. Two electrode pads adhere to the victim’s chest. Simple diagrams demonstrate correct placement. The pads have a conductive medium through which defibrillation may be delivered. Once the pads are placed on the victim, the AED analyzes the victim’s heart rhythm. In a matter of seconds, the AED determines if a shockable rhythm is present. If the AED recognizes a shockable rhythm, it will automatically begin to charge to the proper energy level. Voice and visual prompts will instruct the rescuer to deliver a shock, or in some models, the shock will be delivered automatically. If the AED does not recognize a shockable rhythm, it will instruct the user to provide CPR. AEDs are proven to be very reliable and accurate in recognizing abnormal rhythms and restoring healthy heart rhythms. To ensure AEDs are ready to go the instant they are needed, it is essential to keep them stored at or near room temperature and keep them well maintained. AED program managers should check devices regularly they are readily available and in good working order and make sure there are ample supplies and accessories on hand. AEDs are designed to need little maintenance. Most units have self-testing functions to monitor for optimal performance. Visual and/or audible warnings advise users of any potential problems. Most AEDs come with lithium batteries that do not need to be recharged and may last for up to five years. Defibrillator failures are very rare, but when they do occur, they usually are associated with poor device maintenance or battery failures. For these reasons, it is important to follow the AED maintenance checklists and the manufacturer’s maintenance instructions that accompany each AED. The AHA and others have been advocating early defibrillation initiatives since the late 1980s. In the 1990s, increasing numbers of communities began improving their early defibrillation capabilities. While the average survival rate in the U.S. is 6-7%, some communities have achieved much higher survival rates. For example, in Rochester, Minnesota, where there is strong collaboration among police, fire and EMS personnel, and defibrillators are widely deployed, survival rates have climbed steadily over time from approximately five percent in 1973, to 30 percent in 1990, to 43 percent in 1996 for patients in ventricular fibrillation. Are emergency and public safety personnel in your community ready to defibrillate? If not, it’s time to take action. Early defibrillation is the most critical determinant of survival from sudden cardiac arrest in adults. As critical as it is, early defibrillation is not the only important aspect of treatment. Defibrillation works best when CPR is provided until the AED arrives and when defibrillation is followed by advanced care, including airway and breathing management, medications and mild hypothermia. This is why it is so important to view early defibrillation within the context of the Chain of Survival. Aim to reduce “call to shock” time to five minutes or less in 90 percent of cases. What if a community implemented a comprehensive system for treatment of sudden cardiac arrest (SCA) that uses all treatment modalities that have been shown to be effective? Leaders of a new demonstration project, Take Heart America™ Sudden Cardiac Arrest Survival Initiative, think that systematically applying lessons already learned from science could mean the difference between life and death for hundreds of SCA victims. Three communities of various sizes will participate in the project: Austin/Travis County, Texas, (pop. 1,200,000), Columbus, Ohio (pop. 730,000), and St. Cloud, Minnesota (pop. 125,000). Niskanen and colleagues estimate that if survival rates in these locations increase to even 20 percent, as many as 600 more lives will be saved during the three-year project period. By implementing a comprehensive, multi-faceted approach to SCA treatment, the Take Heart America™ team aims to dramatically improve survival rates from baseline survival rates. “We’re taking approaches that individually have been shown to increase a person’s chances of surviving sudden cardiac arrest and combining them in the hopes of dramatically increasing the number of lives we save,” said Keith Lurie, MD, co-founder of Take Heart America™ and principal investigator of Take Heart St. Cloud™. Rates of overall survival from SCA to hospital discharge in 2005, the baseline for the demonstration project, were 6.5 percent in Columbus, 8.5 percent in St. Cloud, and 10.4 percent in Austin/Travis County.1 The average survival rate nationally is 6-7%. 1The incidence rates of SCA in Austin (57 per 100,000) and Columbus (56 per 100,000) are probably lower than in other communities of similar size, due to the number of college students at the University of Texas and The Ohio State University respectively. Bereavement support for families of victims who do not survive. Once sufficient funding is secured, self-training CPR kits will be used to train approximately 24,000 students in Columbus public schools and to promote more widespread CPR-AED training at The Ohio State University, which already boasts a student CPR Club. “Among other things, we hope to train RAs (resident assistants) in CPR and AED use, and have them, in turn, train dorm residents,” said Lynn White, MS, Take Heart Columbus™ program coordinator. Meanwhile, all schools in the service area have at least one AED, and about 100 ITDs have been placed in first responder units. “We are making huge progress,” said Steinkamp, who noted that since hypothermia was introduced in St. Cloud, 34 patients have undergone mild therapeutic cooling, and of these, 50 percent have returned to their pre-arrest status. Take Heart America™ is off to a good start. On March 27th, a 54-year-old woman suffered SCA in her St. Cloud home. Her daughter and sister called 9-1-1 and gave her CPR. Fire and police first response units arrived two minutes later and provided ITD-assisted CPR. An EMS unit followed and treated her with a defibrillator, shocking her eight times. She was transported to the hospital and was treated with mild therapeutic hypothermia. After rewarming, she awoke immediately in an alert and cognitively intact state. Three days later, she received an ICD and was discharged on April 3rd. It can only get better. For more information, visit www.takeheartamerica.org.